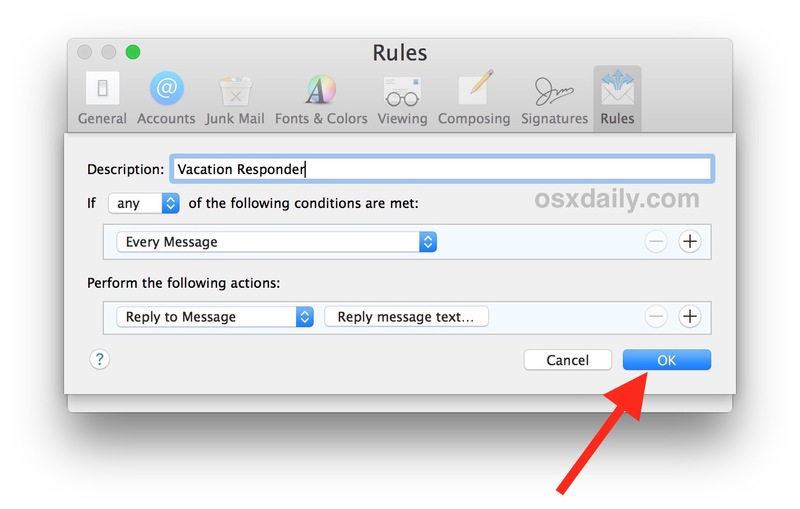 Have you ever wanted to setup an auto-responder eMail message in the Mac Mail app? 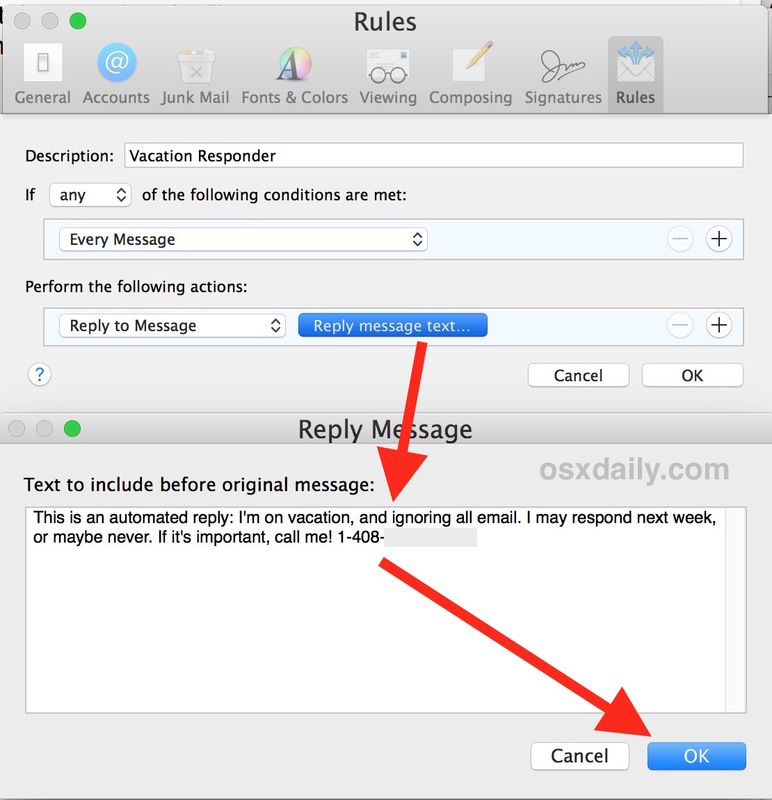 Autoresponders allow you to set an “out of office” auto-reply that gets sent automatically as a reply to any inbound email to the Mac Mail app. This is great solution for situations where you’re out of the office, away from a desk, or otherwise away from email for a while, whether it’s a vacation or maybe you just hate replying to emails. Whatever the reason, all inbound emails will get an automated response with the message of your choice. If you’ve ever sent someone an email and then received an immediate reply that said something like “I’m out of the office right now, please reach me on my cell phone at 555-555-5555” then you have seen how an auto-responder email works. This tutorial will show you how to set up an autoresponder just like that, from within the Mail app for Mac. Setting up autoresponders in Mail for Mac works the same on basically every version of Mail app and Mac OS, so this should be version and release agnostic. As long as you have an email account added to the Mail app for Mac and have the Mail app open and running, the auto-reply will be sent. We’re going to make a broad all-encompassing email auto-responder, meaning the auto-reply will be sent instantly to every single inbound email message to the Mac Mail app. That’s it, the auto-reply autoresponder has been set. You can confirm it’s working as expected by sending yourself an email, which should quickly get the automated response that you set in the auto-responder Rules. If desired, you can setup much more complex rules to auto-reply and autoresponders, for example you could apply the auto-reply to specific senders, specific email from domains, to specific people, to VIP only, for specific dates, and so much more. That is all up to you. For our purposes here we are keeping things simple with a broad universal email auto-reply to all emails from all recipients. If you do not ever disable the autoresponder, it will be enabled and in use for perpetuity as long as the Mail app on the Mac is open and the rule is enabled. Email autoresponders are commonly used for business but many people use them for personal email too. Maybe you’re away from your desk and you want people to know immediately that is the case, or maybe you’re on vacation and don’t want people to email you thinking they’re being ignored, or maybe you do want to ignore email so you’re setting an auto-reply email message that says so. There are many potential use cases for autoresponders in email, so use your imagination and set the conditions as you see fit. 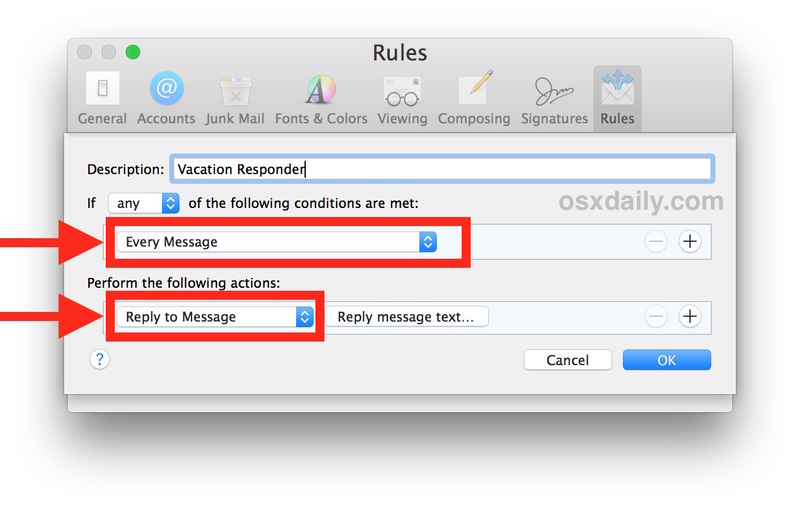 Creating autoresponders for email is just one of the many features available with the Rules feature in Mail for Mac. 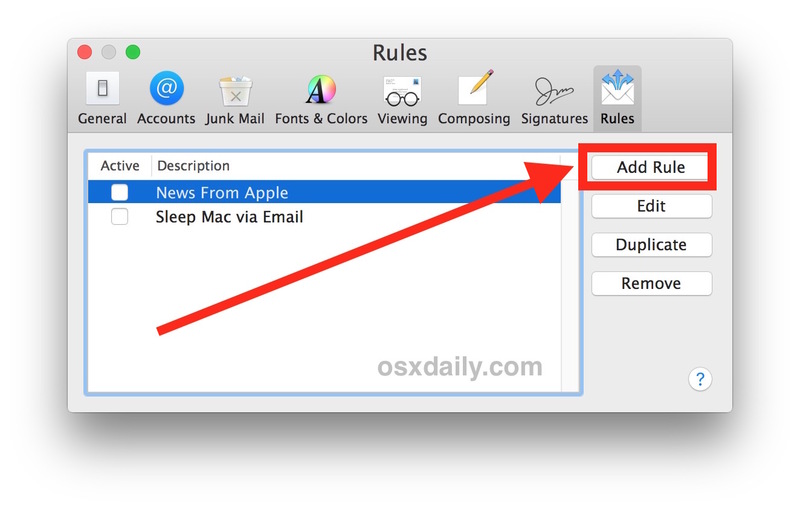 Mail Rules can be quite powerful, offering the ability to remotely sleep a Mac from an iPhone or via any inbound email that meets the Sleep Mac requirements defined by the Mail rule. You can also create auto-forwarding, batch archiving, special sound effects for particular email senders, date specific actions, auto-deletion of emails fitting specific rules, amongst thousands of other possible options through automating email via the Mail for Mac Rules feature. Feel free to explore the Rules options, there are many interesting possibilities! If you enjoyed this tip, you’d likely enjoy this collection of 8 particularly helpful Mail tricks for Mac, or you can browse through our Mail tips section. Was this helpful to you? Do you have any other helpful Mail auto-responder tricks, or Mail Rules tricks for Mac? Share them with us in the comments below! The problem with this is that all “real” out of the office responders only respond ONCE until reset. Imagine if you have it set as described and so does your recipient. Then you send them an email and they send you an out of the office, and your system sends them one back, which your system replies to until one mail system becomes full. Not a good idea. An autoresponder needs more options than this unless it’s for a very specific task. You don’t want an responder to send an auto response to the same person more than once, to respond to marketing emails, to two-way mailing lists (which may start a loop), to reply with attachments included and such. Take care of the Step #6 and more globaly the Autoresponder process himself ! If you have regulary a lot of SPAM, the fact to Autoresponding will send this message also to your SPAM E.MAIL and by the way, you take the risk to receive a lot more than you already have…. Generaly this type of process is to set from a WebMail or from any admin Configuration panel, that will prevent and protected your pro or personal Mac. Spam have to be blocked from and by the source path and not on any Final destination as your local Mac computer is…. I agree with others commenting here. The proper place to do this is on your mail server, which can detect and resolve bounce loops. This is a VERY BAD idea. This will respond to every email message that your email account receives, and it can cause problems with many email systems. If you don’t have an email service the includes an out of office auto-responder feature, you should get on one. Out of office auto-responders are designed to only respond one time to each sender about once a week. My club operates a mailing list. Once someone went on holiday leaving his autoreply set, so every single club message resulted in another autoreply – including his autoreplies – a nightmare avalanche of emails. like others say, it could be an infinite loop or Mail will try to send out reply to every email (including already read in inbox). You might want to run the article thru Grammarly to fix some of the mistakes. Thanks. A more straightforward way is go to your Apple Mail account in iCloud and go to settings. You’ll see the “vacation” icon. Click it and go from there. Also this requires that mail be open and downloading messages. Its best to set this on the actual mail server. If your like most people and your using google you can do so via the settings page in Gmail. Hi Paul – What program are you using to take these screenshots and use of arrows? For this Mail autoresponder article and most others, I use the standard Mac keyboard shortcuts to take screen shots (command+shift+3 and command+shift+4), and just regular old Preview for placing the arrows. I like to keep it simple since that approach works on all MacOS / Mac OS X versions just out of the box, but the third party app Skitch works well too. PLEASE SOMEBODY … ANYBODY … This does not work it turns into a looping nightmare, but the iCloud Vacation setting also doesn’t work … I spent the better part of the day with Apple’s SE trying to fix this and we could not. I set up a ‘Away from my desk’ in Prferances Vacation and it worked with some .com emails, worked with all gmails, but worked with no shaw.ca email addresses and was hit or miss on the remainder. I work from home and am desperate for a solution … can anyone suggest anything that would work, even if I have to purchase I’m okay with that. I would like to know that the AR works and in fact. is going to everyone who sends me email. Thanks in advance! Hi Paul – This is VERY BAD idea. For good reasons professional autoresponder send a message only once to a person. Imagine two persons setup this simple autoresponder and one person sends a single message to the other one… eg. responding to emails while on vacation. An endles looping nightmare started! Each of the mailboxes explodes in seconds, and much more. Paul, please remove the article or change it. Recommend only the use of professional server-based out-of-office responders. In the present way this article gives you bad reputation you do not deserve! It’s a feature of iOS, why is using a feature of iOS a bad idea? Do you think Apple implemented a bad idea in their system software? What is your office like if they think out-of-office responders are bad for office reputation? Does nobody take a vacation?